Identification: Page and Burr (1991); Jenkins and Burkhead (1994). Native Range: Endemic to the Chowan, Roanoke, Tar, and Neuse river drainages of Virginia and North Carolina (Page and Burr 1991). Table 1. States with nonindigenous occurrences, the earliest and latest observations in each state, and the tally and names of HUCs with observations†. Names and dates are hyperlinked to their relevant specimen records. The list of references for all nonindigenous occurrences of Ambloplites cavifrons are found here. Means of Introduction: Intentional stocking for sportfishing. The lower James River was stocked in 1877 with fish from "Stony Creek". There are many "Stony Creeks" in Virginia, but this probably refers to one in the Chowan drainage. One individual was caught six years later. No others have been recorded. The upper James was also stocked in 1877 with fish from the Roanoke. This stocking also failed. In 1879, two adults from the Roanoke River were stocked in the New River at Radford, but they too failed to reproduce (Jenkins and Burkhead 1994). Status: Extirpated in the upper and lower James and middle New drainages in Virginia. Stockings in North Carolina did not establish populations (McBride et al. 1982; Jenkins and Burkhead 1994). 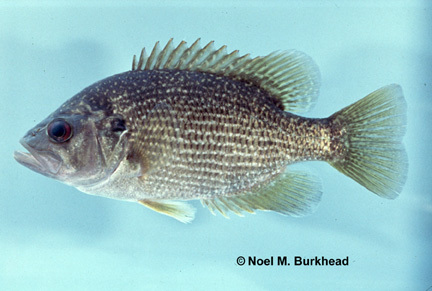 Remarks: Roanoke Bass are nearly extirpated in the upper Roanoke drainage due to competition from the introduced rock bass A. rupestris (Lee et al. 1980 et seq. ; Jenkins and Burkhead 1994). Both North Carolina and Virginia list Roanoke Bass as a species of special concern (Jenkins and Burkhead 1994). McBride, F.T., R.I. Jones, and F.A. Harris. Growth rates and food habits of Roanoke bass in the Eno and Tar Rivers, North Carolina. Proceedings of the annual conference of the Southeastern Association of Fish and Wildlife Agencies 34:341-348.